Last week was a week of goodbyes and homecomings. We found out that we’ve to move back to Bangalore in two months time. I had always thought that I would welcome the news with open arms but was surprised to find that I had mixed feelings. I have grown to love Hyderabad, and our home in the city. Its our first home together after we got married, where we’ve filled an empty space with love and memories. Its going to be difficult to leave everything behind, but we also have a chance now to make new memories in Bangalore, closer to our family and friends. It was also a weekend filled with a road trip, lots of excitement and a farewell. My father-in-law who teaches in Mysore is retiring and his department put together a fantastic farewell ceremony for him where he was felicitated with much love and adoration. The good news is that this isn’t the big ‘ole goodbye for him. In his words, its “Au Revoir” which means ‘see you again’ as he’s not going just yet. He’s been granted Professor Emeritus status and will continue to teach for another three years. It was so heartening to see how much he was loved by his colleagues and students alike, and what a difference he’s made to their lives. We were all bursting with pride! Because of all the travelling that we’ve been doing, we had a lot of frozen shrimps sitting in the freezer, just waiting to be eaten and I decided to use them all at once and make shrimp cutlets. I’ve been wanting to try these for ages now but I wasn’t sure how to do it. 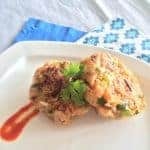 Then I decided to use the same techniques as for vegetable cutlets and surprisingly, they were phenomenal! Pulse the shrimp in a food processor a few times until a coarse paste forms. I like it slightly chunky. Add all the other ingredients except olive oil and mix together till the seasoning is well-distributed. Don’t over mix. Add olive oil to a non stick pan and heat. In the meanwhile, form shrimp mixture into patties. Place patties on the hot pan for 5 minutes on each side. Do not move them around too much. 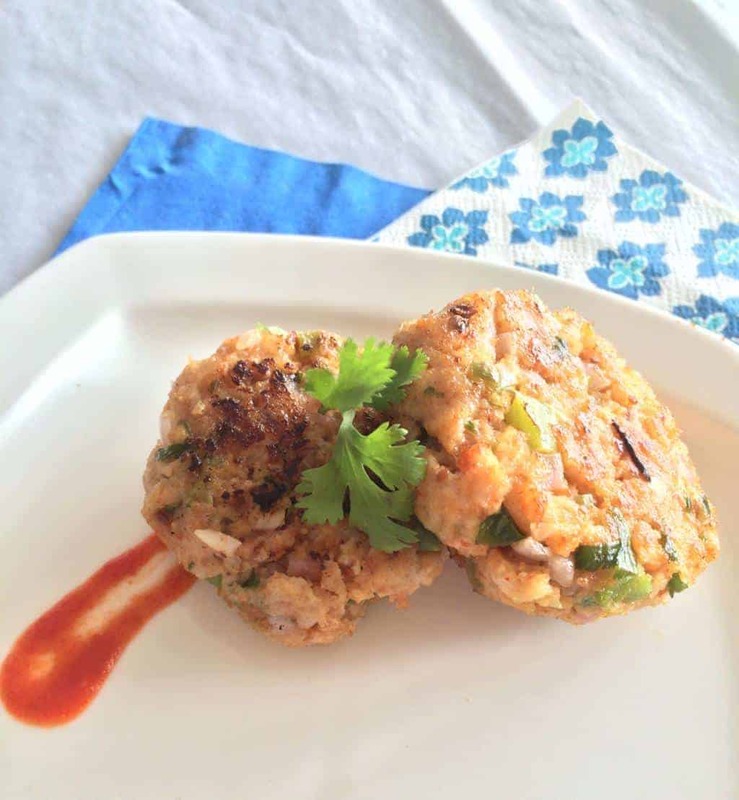 Serve with Siracha and bread rolls, or wrap in a chapati to make a healthy kathi roll.